Every organization—small, medium or large—requires a service desk to deal with requests originating from customers and employees; they basically need a ticketing system that tracks the submission and resolution of problems. Ticketing systems have been around for years, and the biggest technology evolution they have undergone of late is to go from being hosted in-house to being offered as a cloud service, but that not expecting the needs of millennials who desire new age experience for support–they want to interact with virtual agents. Legacy service desks are reactive, in the sense that someone or perhaps some machine has to open the ticket to report a problem before the IT team can resolve it. Multiple people are involved throughout the whole process. Without a self-service objective, information is not available for self-consumption by users. Today, service desk owners prefer their process be proactive and predictive and there are several converging factors that drive the need for it. For one thing, service desk tickets don’t just come from humans anymore, but also are machine-generated. And once you start with machine-generated tickets, the volume of open incidents skyrockets; agents manning the service desk can’t keep up and they begin to ignore tickets. A second factor is that the cloud has increased the complexity of computing architectures, from a traditional n-tier client-server relationship to microservices-driven architectures centered around APIs and serveless computing. In this complex kind of architecture, it’s a challenge for agents to determine the root cause of problems and resolve them. Around 87% of service desk costs are associated with personnel, according to “How to Determine Your IT Service Desk Staffing Ratio” by Gartner analysts Siddharth Shetty and Chris Matchett. And here we are, adding to service agents’ workload by giving them more tickets to respond to and more complex issues to solve, at a time when turnover in these positions is relatively high. 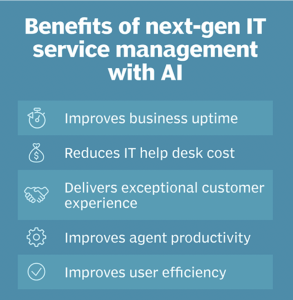 AI and automation can lift the burden on the service desk team since historical ticket and alerts create excellent input for analysis, learning, and baselining. It is one of the important data-driven applications that true-AI can be applied where machines-making-decisions can automate a whole gamut of tickets. Instead of a service desk agent chasing down a needle in a haystack, the system can sift through the clues and suggest what the problem might be and how to approach it. In essence, executives want service desk that enable operations to be proactive, predictive, prescriptive and personalized. Those four Ps can be addressed with four As: AI, analytics, automation and agent intelligence. AI comes into play to correlate historical and diverse information and create a “service desk brain” capable of making decisions on its own. Analytics complements AI when there is a lot of information in different repositories, automation is where the service desk actually performs the actions to solve a problem and agent intelligence, which is the last piece, returns the power back to the service agent with a lot more context and empowerement aiming at reducing their time to resolution for complex incidents.